Saving seeds is both a science and an art. Here are 27 things I’ve learned about seed saving over the years. 1. Saving seeds helps preserve the genetic material of the plant varieties we have. Within the last 100 years, we’ve lost over half of the varieties we used to have. 2. 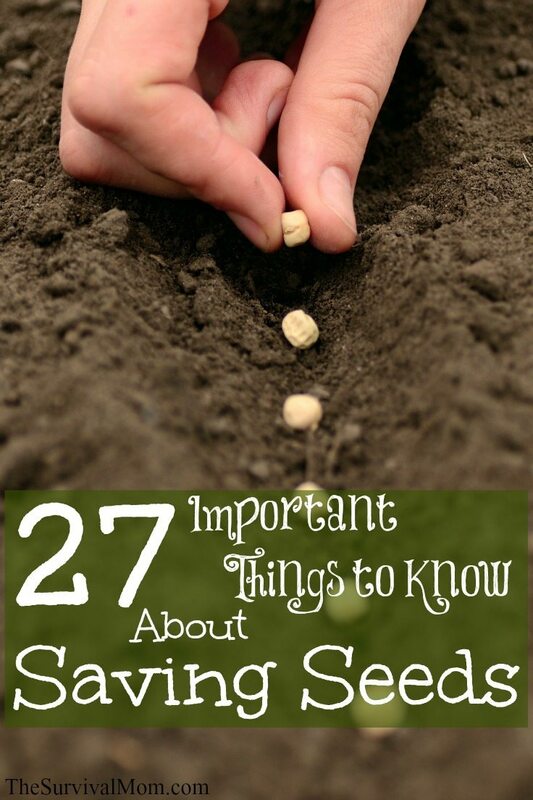 Saving seeds will give you crops that are better adapted to your specific environment. You’ll be collecting seeds from the plants/varieties that thrived. It gives you a lot of control over what grows in your yard. 4. It’s easy to share and trade seeds with others. 5. Save seeds from heirloom and open pollinated varieties. An heirloom variety is one that has been passed down within a family for 50 years or more. Open pollinated is simply a plant that has pollinated by itself or its type. Both will give you crops true to the original plant. 6. Seeds from hybrid plants will not give you the same crop as the original plant. In fact, seeds saved from a lot of hybrid tomato varieties end up growing cherry tomatoes! One something is hybridized, anything in the genetic chain can come up in a crop. If you’re serious about saving seeds, you’ll need to take steps to avoid cross pollination, which will produce hybrids! 7. If you live near large commercial farms that grow soybeans, alfalfa, canola, corn, cotton, or sugar beets, there’s a very good chance those crops are GMO. There’s a possibility that cross pollination could occur, but the seeds that are available to the consumer are not GMO. 8. If you intend to save seeds from specific plants, it will take some planning to avoid cross pollination, since bees and other pollinators, including wind!, carry pollen from blossom to blossom. Read more about this here. 9. You can avoid cross pollination by placing small organza gift bags over the blooms you want to protect and hand pollinate. These are nice because they’re reusable and you can use the drawstrings to tighten the bag over the plant. 10. Hand pollinate early in the morning while the pollen is still visible. Female flowers are only open once. 11. Know what your neighbors are growing, if possible. Some plants, such as carrots, are in danger of cross pollination if other carrots are being grown within just a mile! 12. To physically collect seeds, know that some seeds are harvested dry by letting the plant go to seed, while others, such as tomato seeds, are harvested wet. 13. Dry harvest seeds from plants such as onion, beans, basil, carrots, and others that produce the seeds in pods or husks. Make sure the seeds are completely dry — I check to see if the pods “crackle”. Then, remove the seeds, shake off any chaff, and store. 14. To save basil seeds, wait until at least half of the seed stalk has turned brown. Then snip the stalk off, put it in a bag and bring inside for the seeds to dry. 15. Wet harvest seeds from tomatoes, pumpkins, eggplant, and squash by washing the seeds and allowing them to dry completely. 16. Save only the very biggest seeds from the plants that thrived best. 17. Keep saved seeds at a stable temperature in a cool, dark, and dry place. The vegetable crisper drawer in your refrigerator is a good location, but keep the seeds there, since a consistent temperature is the most important variable for maintaining seed viability. 18. Degradation of viability begins at around 80-85 degrees Fahrenheit. 19. Storing seeds in the freezer is an option for very long term storage. 20. Use paper envelopes for short term storage. 21. Place the paper envelopes in small jars or Ziploc freezer bags. Do NOT vacuum seal or use oxygen absorbers. 22. Saved seeds will retain their best viability for 1-3 years. After that there will be a gradual decline in their viability rate. 23. Seeds may germinate but that does not mean the plant will thrive. 24. The easiest plants from which to save seeds are peas, beans, lettuces, and peppers. They self-pollinate most of the time. To be on the safe side, plant one variety in the front yard and a second variety in the back to avoid the possibility of cross pollination. 25. Save seeds from peppers by simply removing them from the pepper once it’s fully mature. (Bell peppers turn red when mature.) Put the seeds in a jar with water and shake the jar for a minute or two. Good seeds will sink to the bottom; seeds not worth saving will float on top. Throw those away and dry the good seeds. 26. If you’re growing both hot and not-hot peppers, “hot” is a dominant trait! If Scotch bonnet peppers are grown near bell peppers and any cross pollination happens, your bells will be HOT. Plant hot varieties in the back yard, not-hot varieties in the front, or just far away from each other on your property. 27. Coordinate with friends when it comes time to plan your gardens. Since serious seed savers know they have to separate varieties in almost every case, plan who will grow what and then share your saved seeds.